Palm Springs first golf course opened in downtown Palm Springs in 1926, and today O’Donnell Golf Club members are still enjoying those original nine holes. Wildcat oil tycoon Tom O’Donnell came to Palm Springs for health reasons after striking it rich in the oil fields of Southern California and Mexico. He bank rolled an expansion of The Desert Inn Hotel where he used to stay and worked out a long-term land lease for his golf course just behind the hotel. The Desert Inn continued operations until 1967. And while the El Mirador Golf Course in Palm Springs opened briefly in 1929, it was almost 21 years before the next Palm Springs area golf course, and then many more started springing up around the Coachella Valley from Palm Springs in the West to Indio and even Salton Sea at the East end of the Valley. During the 1960’s and 70’s over 40 new golf courses and golf country club communities were developed in the Palm Springs area making the area the world’s number one desert playground at the time. During the 80's and 90's, real estate development started migrating eastward from Palm Springs into the cities of Indian Wells, Palm Desert, Rancho Mirage, La Quinta and Indio. In 2001 the Palm Springs area’s 100th golf course opened. 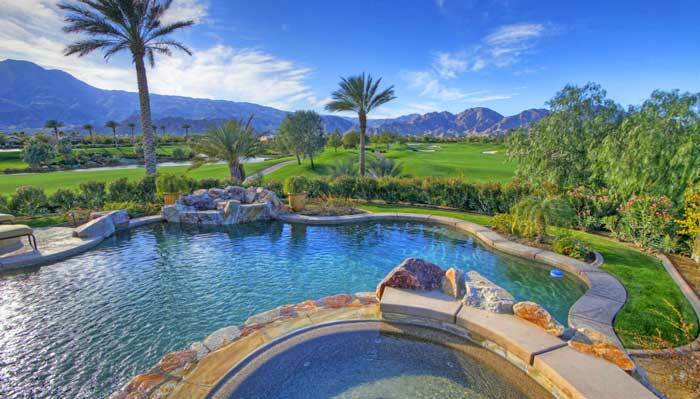 Many of the newest Palm Springs area golf and country club communities were developed in the City of La Quinta including Andalusia at Coral Mountain, PGA West, Hideaway Golf Club, and Rancho La Quinta Country Club to name just a few. Here on this Palm Springs area real estate website you can discover information about each community and browse real estate listings to find your home or luxury condo to enjoy the resort lifestyle available here in the desert. Can We Help You Find Your Home In The Palm Springs Sun? My Sheri Dettman & Associates team of specialists has helped hundreds of people in all prices segments. Can we help you find your Palm Springs area home or luxury condo?